I’m happy to announce that we have a pretty cool new feature coming this week: support for linear stories. As you can see from the screenshot to the right, support for linear narratives is in addition to our current system. It’s also the first phase of group support, which is coming in the next few weeks. With a few little tweaks here and there, we’re hoping the ability to produce linear stories will appeal to a slightly broader audience and make for some more compelling content on Protagonize. It should allow authors to exert a little more thematic control over stories, if they so desire. The concept fits quite tidily into our existing interface, without much of a change to users aside from the new story type toggle. The only thing you’ll really notice that’s different is that instead of branches, linear stories are comprised of chapters, like a novel. From the reader’s perspective, that’s the only difference. From the story author’s point of view, there’s one other small change of note: in a linear tale, the original story author gets to decide how chapter titles are written. They’ll have the option of sticking with the current addventure-style titles, where the author of the post writes the next branch’s title. Alternatively, they’ll now be able to create a story where all authors write their own chapter titles. This only affects linear stories, though. 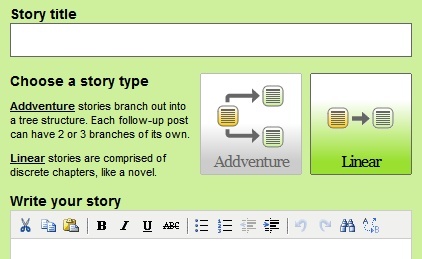 In the meantime, look for linear story support to be enabled in the next day or two. Enjoy! I’m having trouble with this… I can’t create a Linear story. It seems absolutely convinced that I really meant to write an Addventure. Help me!!! This turned out to be a Safari issue — we’ll try and have a fix up tonight or tomorrow. I have tried everything I can to get around this, but I cannot. Instead I’ve had to submit Addventures.